HA NOI (VNS)— More than of 100,000 hectares of land were cleared of bombs and mines during 2012 and 2013, but it would take Viet Nam many years and billions of dollars to finish the job completely, officials said yesterday. At a development partnership conference on mine action yesterday, Prime Minister Nguyen Tan Dung called on international donors and organisations to increase their support for the country's efforts, and assist victims of bombs and mines. "Although we have enjoyed peace for decades, the aftermath of the wars remains a big problem for the country," Dung said. 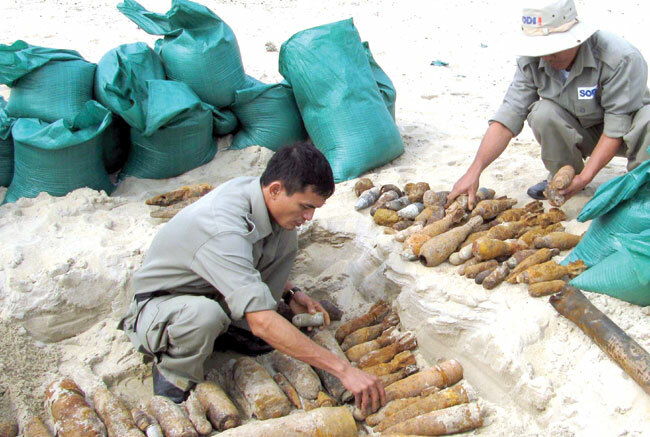 "Almost every locality of Viet Nam has areas heavily contaminated with bombs, mines and other unexploded ordnance, which will take a long time and significant resources to clear," he added. According to the National Mine Action Programme for 2010-25, sometimes referred to as Programme 504, about 6.6 million ha, equivalent to 22 per cent of Viet Nam's land mass, is thought to be contaminated. Since 1975, unexploded ordnance (UXO) has killed more than 40,000 people and injured over 60,000. Currently, donor countries provided aid to support mine action in Viet Nam primarily through international organisations and non-governmental organisations with an average of about US$5-7 million a year, according to statistics from Programme 504. The Government has spent about $30 million a year on mine clearance work and $50 million for resettlements and social security in recent years. Lieutenant General Nguyen Chi Vinh, deputy minister of defence and member of the State Steering Committee for Programme 504, said the resources required for the post-war de-mining efforts were still limited – coupled with problems such as a lack of equipment to handle undersea activities, emergency aid for victims and research and development of de-mining equipment. "It is a war we are fighting during peacetime and Programme 504 has a lot to do," Vinh said. That included calling for more direct international funding as the Government estimated it could only meet half of the demand, officials said. Since 2010, Programme 504 has compiled data in 49 out of 63 provinces on bombs and mines nationwide, and found that 7,645 communes were contaminated with unexploded ordnance. Deputy Assistant Secretary Samuel Perez said helping Viet Nam to address UXOs was a priority for the US, and US Secretary of State John Kerry had signed an agreement in December 2013 to further co-operation. "Viet Nam's commitment to a transparent and inclusive national programme on mine action is an encouraging development," Perez said. "While resources are critical to implementing mine action activities, they must be co-ordinated and applied to a clear set of priorities which requires openness and information sharing between Government and donors." At the conference, other foreign representatives also agreed with the need to establish the Mine Action Partnership Group, which will serve as a policy dialogue with current and potential mine action donors, mine action international NGOs, the private sector and the local civil organisations.